counseling services in Cuyahoga County and Summit County. estate administration efficient, effective and affordable. Cuyahoga County, Summit County and surrounding areas. Summit County and surrounding areas. 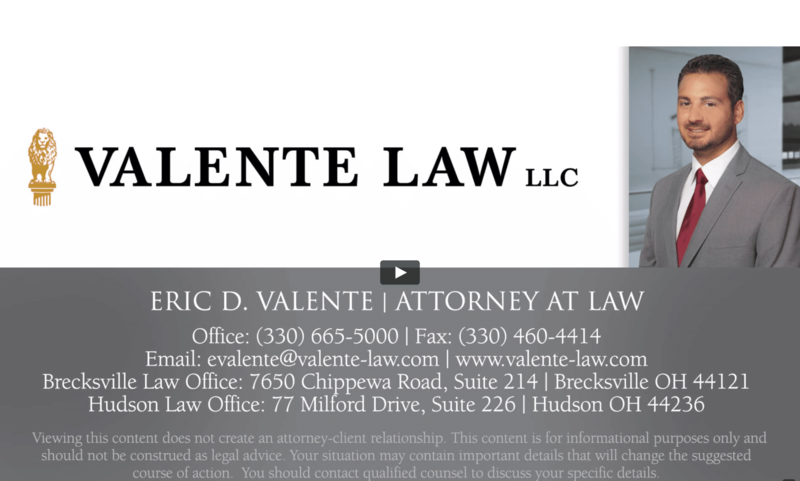 Valente Law, LLC’s Brecksville, Ohio lawyer and Hudson, Ohio lawyer provides comprehensive estate planning, probate, real estate and business law services. Our Brecksville, Ohio Law Office is located at 7650 Chippewa Road, Suite 214, Brecksville, Ohio 44141, and can be reached at (440) 792-6777 or brecksville@valente-law.com. Alternatively, our Hudson, Ohio Law Office is located at 77 Milford Drive, Suite 226, Hudson, Ohio 44236, can be reached at (330) 665-5000 or hudson@valente-law.com. We are accepting new clients at both locations. Our business lawyer counsels business owners and high level executives on every stage of their business. From start up, to managing the business, and all the way to exit planning and selling the business. Our business law attorney services include drafting and filing the corporate formation documents, handling on going transactional and operational corporate counsel services and assisting in the eventual sale or succession of the business. With law offices in Hudson, Ohio and Brecksville, Ohio our business attorney works with clients all over the greater Cleveland, Ohio area. For more information on estate planning law, check out our main business lawyer information page. Likewise, our Brecksville, Ohio estate planning attorney and Hudson, Ohio estate planning attorney counsels estate planning clients on every stage of the estate planning process. First, with drafting and implementing the estate plan with wills, trusts, power of attorney documents and health care planning documents. Then, assisting with managing the trust and facilitating your intentions. And then finally, working with the beneficiaries to ensure the client’s wishes are respected when they are gone. Our standard estate planning attorney services include designing estate plans using a mix of standard estate planning documents like a will and power of attorney, and enhancing the estate plan with revocable living trusts, irrevocable trusts and other advanced estate planning tools. For more information on estate planning law, check out our main estate planning lawyer information page. Valente Law’s Brecksville, Ohio probate lawyer and Hudson, Ohio probate lawyer assists in all aspects of probate estate administration. Our estate planning lawyer services brings a lot of probate administration work to our firm. We handle the probate estate administration for our clients. Additionally, we assist them in their role as executors, and in some cases, we even act as executor for our client’s probate estates. We regularly practice in Cuyahoga County Probate Court, Summit County Probate Court, Medina County Probate Court, Lorain County Probate Court, and all surrounding areas. Our goal is to help simplify the probate estate administration for our clients. For more information on estate planning law, check out our main probate lawyer information page. We provide real estate attorney services for clients all over the greater Cleveland, Akron areas. Our real estate lawyer handles real estate transactions from the simple for sale by owner residential sale, to complex commercial development. Our real estate law firm staff commonly draft deeds, promissory notes, mortgages, and many other real estate legal documents. We handle real estate disputes and can help negotiate a quick settlement or handle a real estate lawsuit. Real estate disputes can include Home Owner’s Association disputes or enforcement cases, partition cases between co-owners and all sorts of landlord tenant disputes, including evictions. For more information on estate planning law, check out our main real estate lawyer information page. As of February 2018, after nearly 3 years in business, we are proud to report that we still have 100% perfect scores on all known client review sites! We take pride in delivering the best legal services we can. To see what some of our clients have to say about us, check out some of our social media profiles and client review pages. If you click the map, you can read the actual reviews our clients have left for our Brecksville lawyer. If you click the map, you can read the actual reviews our clients have left for our Hudson lawyer. We don’t post on facebook often, but check out Valente Law’s Main facebook page to see more reviews from our clients! Also, please like our specific Brecksville, Ohio Lawyer facebook page and our specific Hudson, Ohio lawyer facebook page. Check out Eric Valente’s Client Reviews posted on legal directory Avvo.com. We are here to help solve your business law, estate planning, real estate and probate estate administration attorney service. Business and estate planning clients need a law firm they can depend on, and we build lifetime relationships with our clients through competence, communication and consistency. Contact Valente Law today to accomplish your goals. Our Brecksville, Ohio lawyer and Hudson, Ohio lawyer is currently accepting new clients, and offering free initial consultations. Representing business owners in all aspects of their business, from start-ups all the way to selling. Estate planning services, including wills, trusts and healthcare documents. Efficient, affordable and effective probate administration upon the death of a loved one. Business counseling requires a good corporate counsel that has experience with start-ups, day-to-day business management and operations, and succession planning and mergers, acquisitions and business sales. Corporate counsel should protect your business interests and help you achieve your professional goals. Business start-ups typically require filing Articles of Organization or Articles of Incorporation, executing an Operating Agreement or Bylaws, distributing membership unit certificates or stock certificates and many related services. Contact us today to speak with business attorney for businesses in Cleveland, Akron, Medina and all surrounding areas. Estate planning typically includes a will, trust, healthcare planning documents and many related documents. Estate planning can be complex, but a top notch estate planning attorney can provide creative, cost-effective estate planning documents. Our estate plans range from simple wills for a husband and wife to high level estate planning structures with multiple trusts for multiple generations. The best estate planning attorneys should pay for themselves by saving your estate money in taxes, court costs and professional fees. Contact us today to protect your assets and provide more money to your heirs and beneficiaries. Contact us today to talk to a successful estate planning attorney. A good probate attorney should make the probate court process simple and stress free. In many probate cases we act as the probate attorney and either represent the executor or in some probate cases, we act as the executor ourselves. We will take care of your probate estate and make sure the probate estate administration is efficient and affordable. We can also handle will contest cases if you suspect that someone has exerted undue influence on a loved one and manipulated them into giving them their estate and make sure you get your fair share of your loved one’s estate. Call us today to speak to a successful probate attorney in Cleveland, Akron and the surrounding areas. A good real estate attorney should be able to handle real estate transactions, real estate disputes, draft real estate documents and more real estate lawyer services. We handle real estate transactions for buyers and sellers. Real estate transactions can range from a standard residential sale to a complicated commercial real estate development project. Our real estate attorney handles real estate disputes and lawsuits. We can negotiate quick resolutions when appropriate or file a lawsuit. Real estate disputes that we can handle include partition actions between co-owners, real estate contract disputes, landlord tenant disputes, home owner’s association issues including enforcement. Additionally, we draft deeds, survivorship affidavits, leases, purchase agreements, promissory notes, mortgages and more. We’ve helped clients all over the greater Cleveland, OH and Akron, OH areas, with our main offices in Hudson, OH and Brecksville, Ohio. 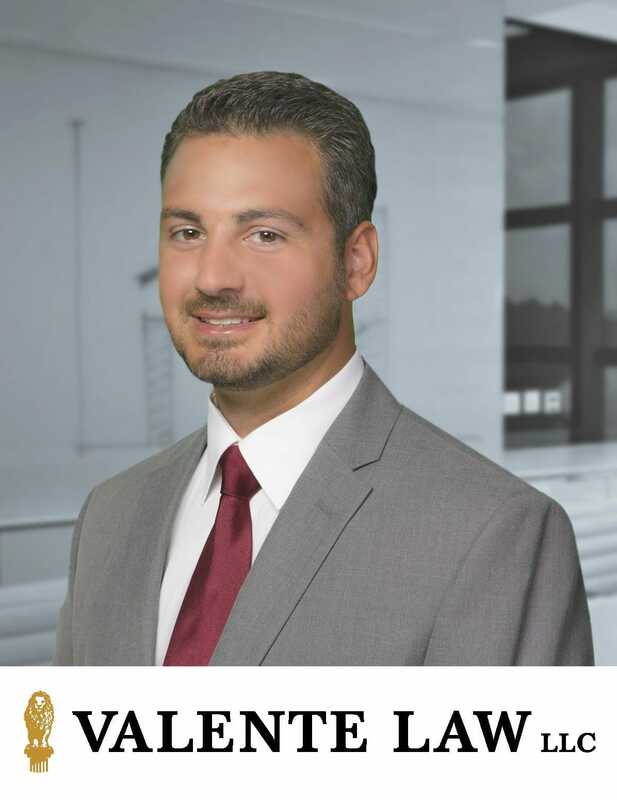 Attorney Eric Valente, JD, MBA, is a lawyer and founding member of Valente Law, LLC. While earning his law degree at the University of Toledo, he studied business administration and graduated with his MBA as well as his JD. Eric started his legal career focusing on business litigation at the law firm J.W. Krueger & Associates, LLC, where he still maintains an office. Eric’s creative and entrepreneurial spirit led him to start this law firm, and estate planning, probate, real estate and business law offer him the chance to engage these interests and help clients achieve their goals. Eric is accepting new clients now and offers free consultations for most legal engagements. Welcome To Our Estate Planning, Probate, Real Estate and Business Law Firm!